LEGO Technic models combined to make models that not only look great, but actually do something too: swivel, pivot, lift, rotate, and more. LEGO Technic provides a real challenge for experienced LEGO builders. With elements like working suspensions and pneumatic power, everyone can build a range of vehicles that have realistic, real-world functions, from automatic opening doors to powerful four wheel drive. From cranes to the latest supercar, each set can be rebuilt into another vehicle, expanding the play possibilities even further. The LEGO Technic building system makes it possible to build advanced real life functions like gearboxes, working piston engines and crane arms, which integrate with other LEGO bricks. 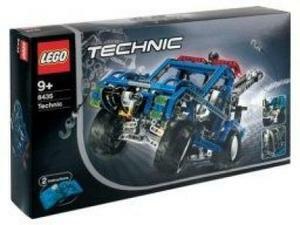 This is a BRAND NEW, HARD TO FIND AND DISCONTINUED set of LEGO TECHNIC 8435 4WD from 2004. This set is still factory sealed and the box is in very good condition with minor shelf wear. 763 pieces, 0 minifigures_? 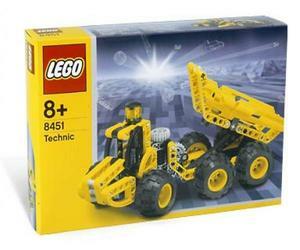 This is a BRAND NEW, HARD TO FIND AND DISCONTINUED set of LEGO Technic 8451 Dumper from 2003. This set is still factory sealed and the box is in very good condition with minor shelf wear. 183 pieces, 0 minifigures. This is a BRAND NEW, HARD TO FIND AND DISCONTINUED set of LEGO TECHNIC 8294 Excavator from 2008. This set is still factory sealed and the box is in very good condition with minor shelf wear.€Ÿš 720 €?š€?špieces and 0 minifigures_? This is a BRAND NEW, HARD TO FIND AND DISCONTINUED set of LEGO TECHNIC 8289 Fire Truck from 2006. This set is still factory sealed and the box is in very good condition with minor shelf wear.€Ÿš 1035 €?š€?špieces and 0 minifigures_? This is a BRAND NEW, HARD TO FIND AND DISCONTINUED set of LEGO TECHNIC 8416 Forklift from 2005. This set is still factory sealed and the box is in very good condition with minor shelf wear.€Ÿš 729 €?š€?špieces and 0 minifigures_? This is a BRAND NEW, HARD TO FIND AND DISCONTINUED set of LEGO TECHNIC 8244 Convertables / Transformator from 1996. This set is still brand new, however 1 of the seal is broken. All the contents inside are brand new and still sealed in its original polybags. The box is in good condition with very minor shelf wear, wrinkles and crease.€Ÿš 275 €?š€?špieces and 1 minifigure_? This is a BRAND NEW, HARD TO FIND AND DISCONTINUED set of LEGO TECHNIC 8202 Bungee Chopper€Ÿš from 1998. This set is still factory sealed and the box is in good condition with some shelf wear, wrinkles and crease. 72 pieces, 0 minifigures_? This is a BRAND NEW, HARD TO FIND AND DISCONTINUED set of LEGO TECHNIC 8215 Gyro Copter€Ÿš from 1997. This set is still factory sealed and the box is in good condition with some minor shelf wear, wrinkles and crease. 107 pieces, 0 minifigures_?